My name is Damon from Northern NSW and I am using an app I designed to help look after my 7 year old disabled son. 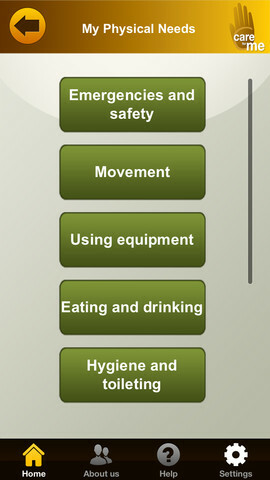 It is a video diary type app where I can keep all of his needs in the one central spot for carers to review. It caters for all disabilities and aged care needs. It is categorised into physical and social needs and a calendar. We love to use it knowing all carers are equally aware of the cares required and it is time saving when it comes to refreshing routines to a carer who has not looked after him for a while. ‘Care for Me’ is now available on the App store for iPad and iPhone. See CareApps Australia for further information and tutorial. Please feel free to spread the word! Contact info@careappsaustralia.com.au if you have any questions or if you would like to have a free product code for the app. Do you have an intellectual or physical disability or care for someone with a disability? Do you frequently need to explain care routines to numerous carers or friends and family? Care for me allows all care requirements to be recorded and reviewed in video, photo or text format. All needs are recorded within specific care categories to provide clear and easily accessible instructions of the cares required.